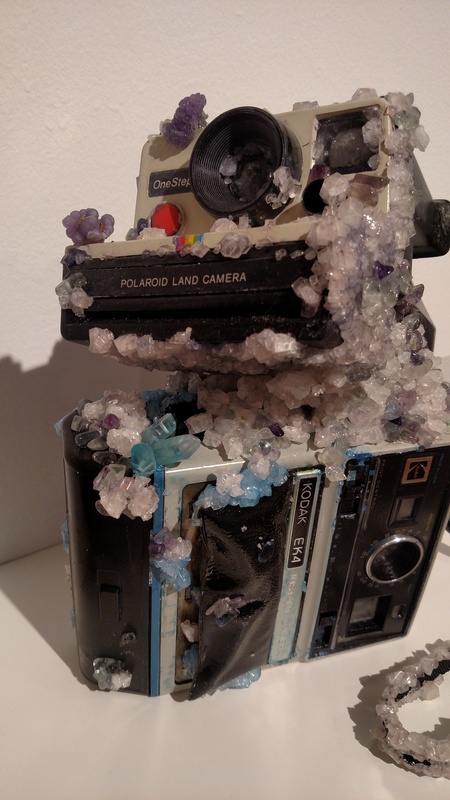 Double Exposure by Erin Zerbe of Adrian, Michigan is a piece consisting of old Polaroid and Kodak cameras encrusted with pieces of what looked like glass and other materials, to appear as if crystals were growing over it. It is an interesting commentary on technology, and I spent several minutes looking at it and thinking about it. The artist’s choice to cover the cameras in crystals, which are beautiful and take time to form, is contrary to the familiar images of old, broken technology being forgotten and covered in layers of dust. 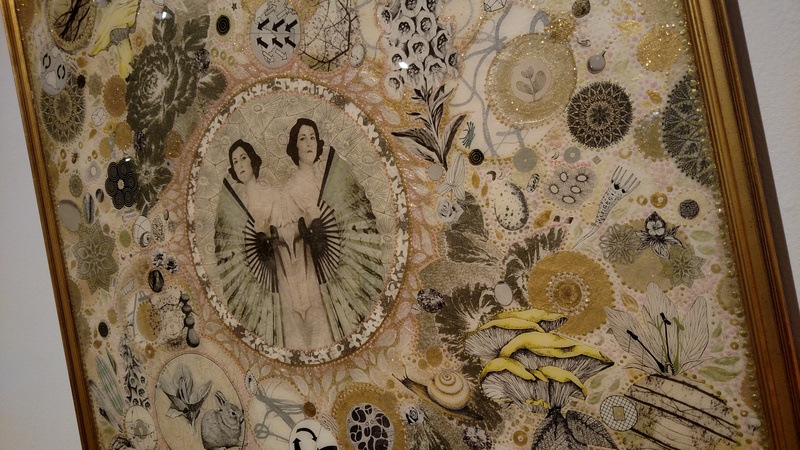 Meiosis (top) and Mitosis (b0tt0m) by Eana Agopian of Kalamazoo, Michigan are two separate mixed-media collages. Especially for those interested in biology and science, these pieces are fascinating because of their obvious inspiration from the cell reproduction processes of the same names. 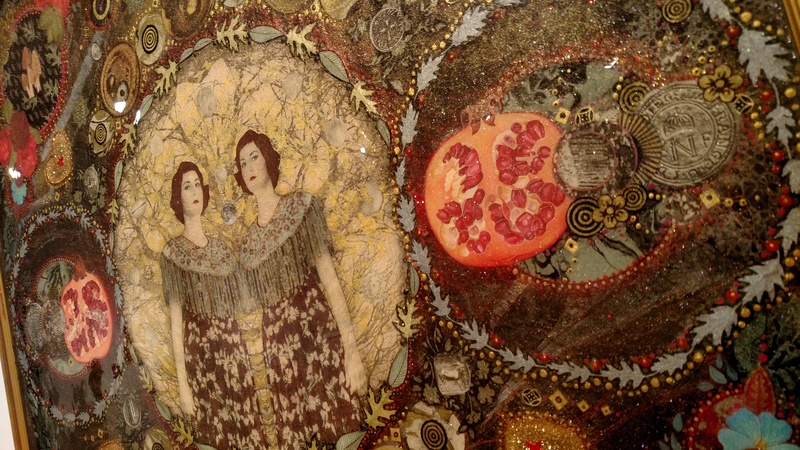 In the center of each are two women mirroring each other and enclosed in a circle, which, to me, seemed to clearly reference a cell’s nucleus as it splits. The surrounding elements, including pomegranates, leaves, geometric shapes, coins, and mushrooms, can be interpreted as the other organelles of the cell (an organelle is to a cell what organs are to the human body). Scream (1996) by Rebecca Griffith of Villa Park, Illinois is a piece composed entirely of VHS magnetic tape and clear tape. 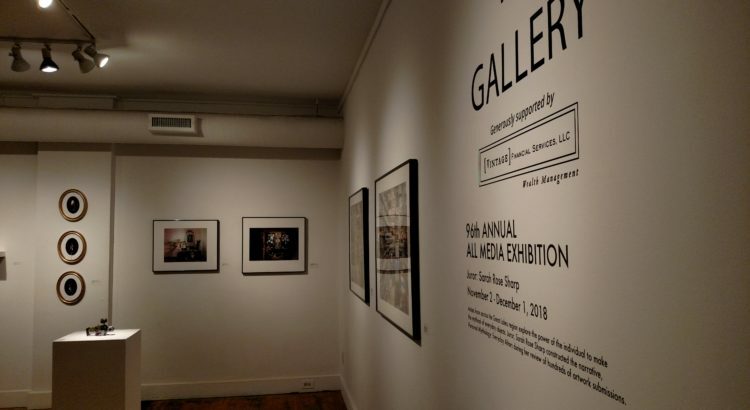 It is hanging on the wall in the gallery in such a way that it looks similar to a tapestry, and I did not even realize what it was made of until I read the placard by it! 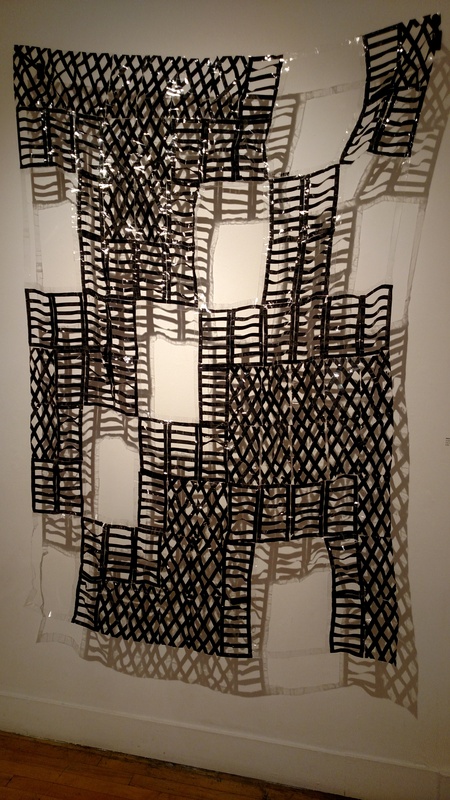 I think that this was my favorite material used in any of the pieces in the Exhibition, because VHS tape and clear tape are so mundane on face-value, and yet the artist created a bold and challenging piece of art from them. The tape is arranged in rectangles of crisscross or stripe patterns and connected so they look like a partial quilt together. Against the backdrop of the white gallery wall with the lights on it, Scream (1996) is especially interesting to look at from different angles, because there is a geometric silhouette on the wall that shifts depending on the position of the viewer, and the dark color of the VHS tape is a stark contrast with the wall. A Peaceful Coexistence Part 1 by Laurie Borggreve of Minneapolis, Minnesota was quite possibly my favorite piece of the entire Exhibition. 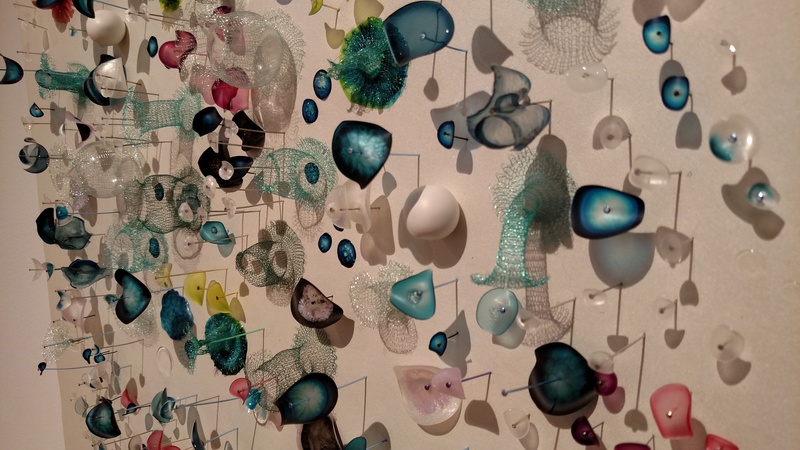 Consisting of colorful glass elements pinned to a board, it reminded me of many different things all at once, including buttons, jellyfish seashells, insects, and sea glass. In addition to being beautiful to look at, A Peaceful Coexistence Part 1 is one of those works that I spent a long time looking at, and that I think could take on many different meanings to those who view it.